Would you make a good teller? Take our career test to find out how you match with this and over 800 other careers. 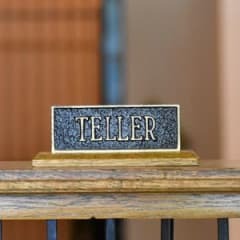 What is the workplace of a Teller like? A teller is someone who works for a bank and is responsible for accurately processing routine bank transactions at a bank. These transactions include cashing cheques, depositing money, and collecting loan payments. Tellers are responsible for the safe and accurate handling of the money they process. When cashing a cheque, they must verify the customer’s identity and make sure that the account has enough money to cover the transaction. When counting cash, a teller must be careful not to make errors. Tellers also seek out customers who might want to buy more financial products or services from the bank, such as certificates of deposits (CDs) and loans. When they think a customer is interested, tellers explain the products and services the bank offers and refer the customer to the appropriate sales personnel. In most banks, tellers record account changes by using computer terminals that give them easy access to the customer’s financial information. Tellers also can use this information when recommending a new product or service. Head tellers manage teller operations. They do the same tasks as other tellers as well as some managerial tasks, such as setting work schedules or helping less experienced tellers. Because of their experience, head tellers may deal with difficult customer problems, such as a customer questioning an error with an account. Head tellers also go to the vault (where larger amounts of money are kept) and ensure that the rest of the tellers have enough cash to cover their shift. Are you suited to be a teller? Tellers have distinct personalities. They tend to be conventional individuals, which means they’re conscientious and conservative. They are logical, efficient, orderly, and organized. Some of them are also enterprising, meaning they’re adventurous, ambitious, assertive, extroverted, energetic, enthusiastic, confident, and optimistic. Does this sound like you? Take our free career test to find out if becoming a teller is right for you. Most tellers work in bank branches. They sit at a computer station and interact with customers from behind a glass partition. Some banks are experimenting with new formats that allow the teller to more closely interact with a customer by changing the place of the teller station or removing the glass barrier.